At a meeting in 2005 held by the The British Society for the Study of Prosthetic Dentistry it was estimated that 11 million people living in the UK wear dentures. These dentures include both partial and full dentures. Removable dentures provide a solution to replace missing teeth. Dentures are simple and inexpensive means to replace missing teeth. Unfortunately dentures are generally uncomfortable and affect the ability to speak and taste food properly. For this reason many denture wearers struggle to cope with dentures and look for alternatives for removable uncomfortable teeth. Dentures are only retained by suction or gravity. Some dentures may have small clasps which are used to assist in retaining the denture in position. Removable dentures unlike dental implants are not connected to the jaw bone so feel 'disconnected' to the person wearing them. Dental implants are inserted into the jaw bone. The titanium dental implants provide a stimulus to the jaw bone and encourage the bone around implants to grow. Dentures do not encourage the jaw bone to grow so long term denture wearers will lose bone density and volume. This patient came to our clinic complaining of loose upper and lower removable dentures. The patient had worn dentures for 12 years and had recently developed an infection around the upper right canine tooth. The patient was experiencing a lot of pain and needed the tooth extracted. On visiting the dentist the patient asked about options for replacing teeth and was recommended to to visit the Brighton Implant Clinic for further treatment. The patient attended the clinic for a thorough examination and was given the options for treatment. Two options for treatment were recommended. Upper and lower full dentures. Upper and lower fixed bridges on dental implants. 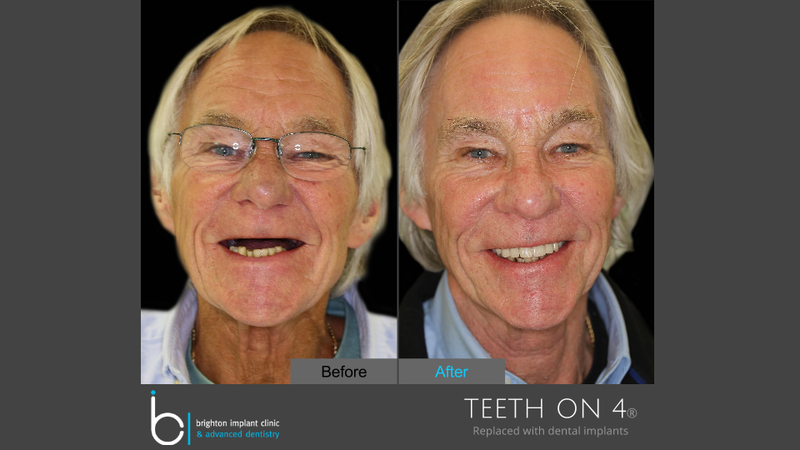 The patient opted for fixed bridges on dental implants as he didn't want to have removable dentures any more. It was decided that the patient would have the upper arch carried out first then followed by the lower arch a month later. The patient was to have the Teeth-on-4 dental implant treatment. In the lower arch, again the remaining teeth were removed and 4 dental implants were placed. Immediately following surgery a provisional bridge was made consisting of 10 teeth. 2 months after the surgery was carried out the upper and lower bridges were removed and the implants inspected to see if they were healing well. The bridges were then replaced on the implants for 3 more months. At 6 months both bridges were removed and impressions taken for upper and lower definitive hybrid bridges. The definitive bridges consisted 12 teeth each. All 8 implants integrated successfully and the patient was pleased with the appearance and function of the definitive upper and lower bridges. 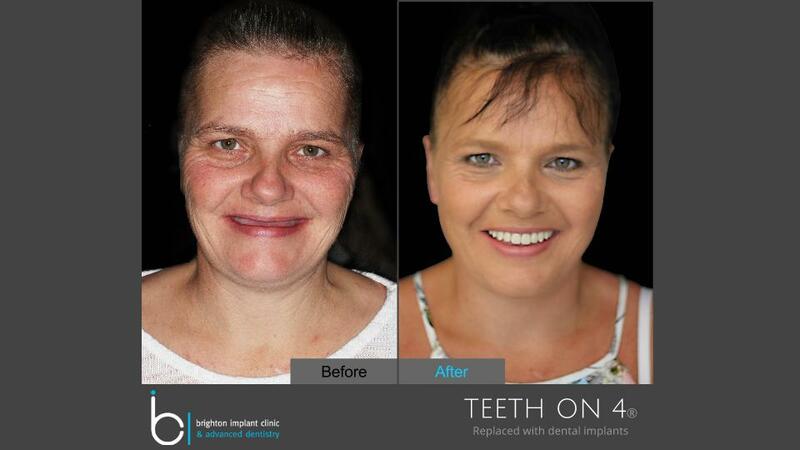 For further information about teeth on 4 please Contact Brighton Implant Clinic or Call us on 0800 111 6623.